We’re extremely excited to announce the launch of two new image sets today on Galaxy Zoo. Working with some new scientific collaborators over the past few months, we’ve been able to access data from two new sources. This blogpost will go into more details on where the images come from, what you might expect to see, and what scientific questions your classifications will help us answer. (See Part 1 of this post to learn about the other new images from the DECaLS survey). The second set of new data comes from the Illustris Project. 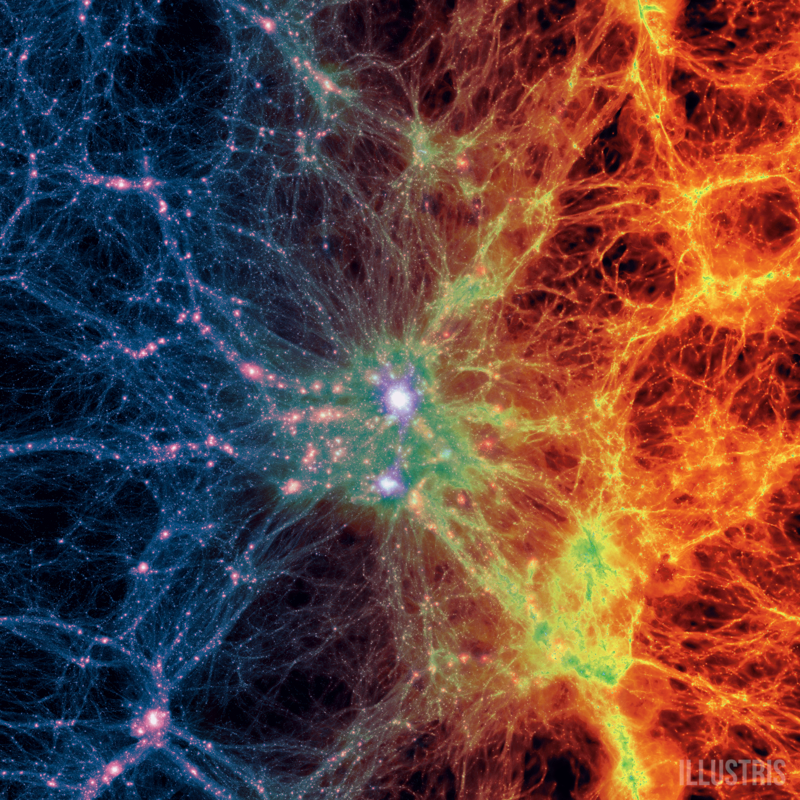 Illustris is a state-of-the-art simulation of the Universe, led by a large team of researchers in the US, UK, and Germany. Large-scale cosmological simulations are a critical tool in astronomy; since we don’t have laboratories where we can replicate the conditions of processes like galaxy formation, we use computer simulations to investigate them instead. Such simulations start with what we believe conditions in the very early Universe were like (which we infer from the cosmic microwave background), and can include both dark matter and baryons (particles like protons and neutrons that eventually form the stars, dust and gas in galaxies). The simulation then tracks what happens to the matter and energy over billions of years as the Universe expands, evolving according to the laws of physics that are programmed into the simulation. This includes relations like the law of gravity, which dominates how dark matter moves, and hydrodynamics, which describe the motions of the gas. It’s truly amazing – scientists can watch galaxies form and evolve over huge scales of distance and time, and compare the results to real observations to test if the physics of the simulations are correct. Illustris is one of the largest and most detailed simulations ever run, taking more than 19 million CPU hours to run on powerful supercomputers. A large-scale projection through the Illustris volume at redshift z=0, centered on a massive cluster. The left side of the image shows the density of dark matter, while the right side shows the density of the gas in cosmic baryons. Image and text courtesy of the Illustris project. This comparison to real data is the key feature that sparked the collaboration between Illustris and Galaxy Zoo. Once the simulation is run, astronomers analyze the results to see if their galaxies match the properties of those seen in the real Universe. This includes measurements like the total number of stars formed, the ratio of stars to dark matter, and the distribution of galaxies of different masses and luminosities. Another critical parameter we want to compare is galaxy morphology; measuring the ratio of ellipticals to spirals, for example, is an important test of whether the galaxy merger rate is correct, and if the simulation codes for star formation and gravitational interaction are correct. The Illustris scientists have created images of the galaxies from their simulation that GZ volunteers will classify by their morphology. 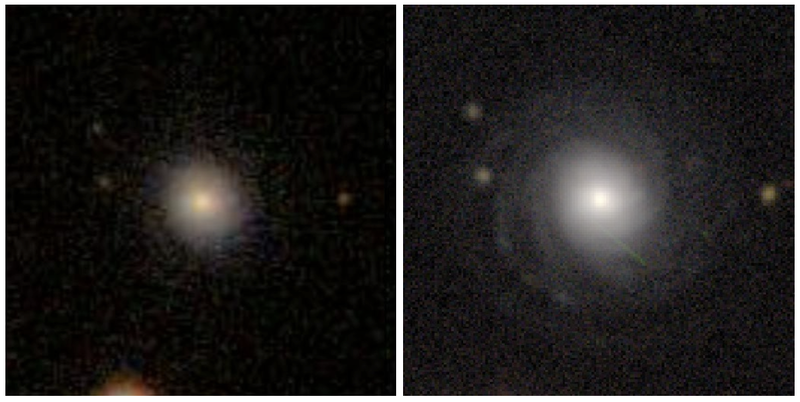 Our comparison data set for this will be the SDSS results from Galaxy Zoo 2, and the images are designed to match the Sloan images as closely as possible. This includes the same set of filters for the telescope, sizing the images so that the galaxies look like they’re at cosmic distance from the Milky Way, and setting them against backgrounds of stars and other galaxies. The quality of the simulations and images are amazing – these look to me like real galaxies in every way. It’s something that astronomers definitely couldn’t do ten years ago. Two galaxies from the Illustris simulation evolving in time from left to right, from when the universe was a quarter its current age, to the present. The top galaxy shows a massive, red, elliptical-shaped galaxy forming after a series of mergers with other systems. The bottom galaxy reveals the formation of a smaller, bluer, disk-shaped galaxy forming after a less violent history of interactions. Images and text courtesy of the Illustris project. Although these images aren’t of “real” galaxies, we want to emphasize again how much your classifications will help scientists to do astronomical research. Simulations like Illustris are the only way that we can probe galaxy formation and evolution as it happens. Your classifications, both from Galaxy Zoo 2 and from the new Illustris data, provide vital tests for the output and will be fed back to the science teams in order to improve future versions of these sims. If you have questions or want to discuss anything you see in the new images, please join the discussion with scientists and volunteers on Talk. The Illustris Project also has some amazing online tools if you want to learn more, including an interactive explorer of the simulation and videos of the evolving Universe. You also can explore specific galaxies you’ve classified via GZ:Examine. As always, thanks to everyone for your help! Hubble, meet Galaxy Zoo. Galaxy Zoo, meet Hubble. Regular blog readers will know that we were all hugely pleased to find out that our proposal to observe Hanny’s Voorwerp with Hubble was approved. This was especially welcome because we expected a very high oversubscription rate for next year – new and repaired instruments meant that there was pent-up demand for some kinds of observations which have not been possible for several years. Nearly 1000 proposals were submitted to the Space Telescope Science Institute (STScI). which managed a complex review process involving about 200 astronomers from all over the world (noting that Hubble is a cooperative project of NASA and the European Space Agency). Specialized panels of reviewers looked at various subfields of astronomy, comparing the likely scientific fruitfulness of a wide range of projects.This last week saw the deadline for the next step in preparing for next year’s Hubble observations – what’s known as Phase II. This uses software distributed by STScI to plan each operation in detail – every exposure, filter change, and minute telescope motion. 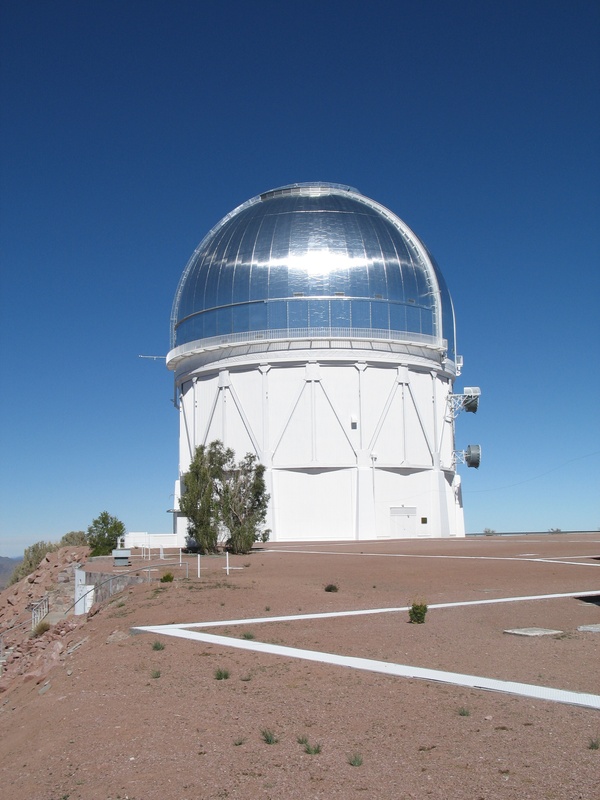 The astronomer can find out whether reordering certain operations uses precious telescope time more efficiently, and whether the results can be improved by restricting the observations to certain orientations of the telescope or times of year. The software will also overlay requested fields of view on sky surveys such as Sloan images), a welcome reality check that you’ve told it to look in the right place. This stage also gives us a chance to see whether anything we’ve learned since the proposal was submitted in early March gave us reason to change any of our originally proposed measurements.